The rags-to-riches story of one of the most popular poets of the Jazz Age has caught the eye of adult biographers repeatedly, and here Goddu brings Millay’s action-packed life to light for young readers. 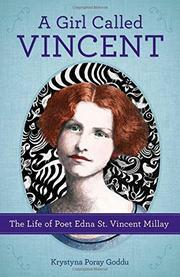 Named in honor of Manhattan’s St. Vincent’s Hospital, Edna St. Vincent Millay early on came to be known as Vincent. Goddu takes great care in highlighting the formative trials and successes of Vincent’s abbreviated childhood and precocious development as a poet. The eldest of three girls raised in rural Maine by a caring, hardworking, and often absent single mother, Vincent found herself having to parent her siblings by age 12. Goddu convincingly shows how Vincent’s adventurous spirit and love for nature—not to mention the spotlight—arose from her hardscrabble, largely unsupervised upbringing, leading her to enter poetry contests at a young age as “E. Vincent Millay” and have the confidence to deliver a recitation that would earn her a tuition-free ride to Vassar just a decade before winning the Pulitzer Prize. In addition to showcasing Millay’s path-breaking feminism alongside her playfulness and tireless work ethic, Goddu’s well-researched account produces an illuminating snapshot of the uphill battle female writers faced trying to earn a living in the first half of the 20th century.